1. find out what your main character wants most and make him/her want it or need it more and more. 2. find something that prevents him/her from getting that thing and make the obstacle bigger and more urgent (it can be internal, another character, or the world your character is in). 3. bring the conflict to a head until the character resolves it by getting what he/she wants, letting go of what he/she wants (and possibly getting something better in return), or coming to accept being without the thing he/she originally wanted. A plot can have several steps, so your main character can start out wanting one thing, get it, and then want something else. For example, in The Cat in the Hat, the main characters ("me and Sally") want something to relieve their boredom until they get it; then they want to avoid getting in trouble. These three steps have infinite possibilities depending on the main character(s), other characters, setting, style, and want/need. If you have an idea for a plot but not a main character, you can easily turn that plot into a main character, too: whatever the objective of the main character in a plot is supposed to be, create a character who is strongly motivated to achieve that objective. Create other characters who are strongly motivated to stop the main character from achieving that objective. For example, some of the people who are motivated to solve a crime are a detective, a reporter, the accused, the victim, and the likely next target. Notice that the more motivated the character is to achieve the objective, the more compelling the story becomes. It will be 30 years this May since the Six Flags Great Adventure Haunted Castle fire that killed eight teenagers. 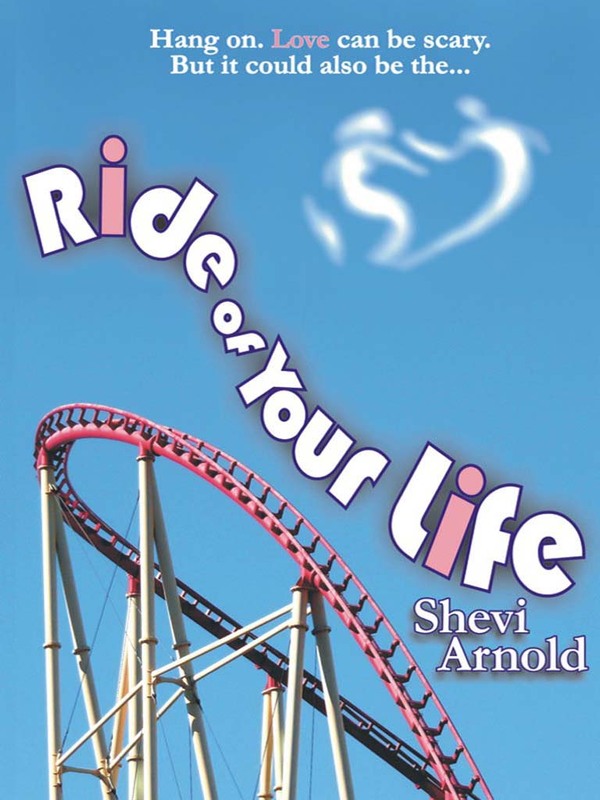 I started writing my YA romantic ghost story, Ride of Your Life, when I was just 19 in an effort to give this tragedy a happy ending. Please join me on my Girls <3 Books Blog Tour to help promote this book, which I will be putting on sale for $0.99 this May. Thank you! I love the costumes, reading the story of how Esther and Mordechai saved the Jewish people, the joy and noise in the synagogue, the festive meal, and giving out baskets of goodies. It’s a chance for me to express my creativity, and it’s just plain fun! It’s traditional for children to dress up in costumes on Purim, but this tradition takes an odd and humorous twist in the story of my grandparents’ courtship in Jerusalem in the mid-1920s. My grandmother fell in love with my grandfather when she was just fifteen. They lived on opposite sides of the same apartment complex, and they sent each other love letters that they pinned to a clothesline that stretched from one side of the complex to the other. It was all very romantic and not at all proper for the son and daughter of two distinguished orthodox rabbis. Of course, if you read my previous post, you already know that when Rivka Schorr wanted something, Rivka Schorr did not let anything get in her way. The fathers sat down, and the marriage was arranged. The wedding was a few months away, and it was a Jewish Jerusalem tradition for a girl to give her fiancé gifts on each of the holidays that took place between the engagement and the wedding. Young Rivka looked forward to Purim. She was going to give her beloved the perfect Mishlo’ach Manot. She had even hand crocheted the cloth that covered the tray of homemade foods. One of my homemade Purim baskets with a garden theme. The Megillah printed scroll came with a story I wrote about Queen Esther asking a bee and a butterfly in the king's garden for advice. It’s traditional to have someone else deliver Mishlo’ach Manot for you, but on this particular Purim something very strange happened in Jerusalem: it snowed. This put young Rivka in a bind. No one would agree to deliver the gift to her fiancé for her. And she couldn’t do it herself, could she? It wouldn’t be proper to visit her fiancé’s house. Oh, no. But this was Rivka Schorr. And when Rivka Schorr wanted something, Rivka Schorr did not let anything get in her way. So Rivka decided to deliver the Mishlo’ach Manot herself . . . disguised as an Arabic man! At first Rivka had thought that she had managed to pull it off, but it turned out that she had pulled it off a little too well. The Mishlo’ach Manot included a bottle of wine, and kosher wine can only be served by a Jew. If it isn’t, it becomes unkosher. My grandfather’s father became so enraged at the thought that a non-Jew had handled it that he poured the wine out and called the wedding off! Of course, Rivka wasn’t going to let that get in the way of her marrying her beloved. She spoke to her father, who spoke to my grandfather’s father, and everything was straightened out. Now, this is a great story, and I hate to piggyback on it, but there is another great Purim story that I want to tell you. My parents lived in an ultra-orthodox and mostly English-speaking neighborhood in Jerusalem. I didn’t like being there on Purim, because the neighbors would often get very drunk. There is a Purim tradition of drinking until you don’t know the difference between blessing Mordechai and cursing Haman. The members of my family have never been big on drinking. My dad, for example, has been known to mix sweetener in semi dry wine. We just don’t like the stuff. But my parents’ neighbors on Purim, oh, boy, do they like to drink! Driving becomes scary because of people stumbling in front of your car. And people bang on your door, because they want to sing and dance for you, loudly and badly. So this is the story that my mother used to love to tell. It would make her laugh so hard that it would bring tears to her eyes. My parents’ apartment is on the first floor of a very tall building, and it has a huge balcony. Huge! The apartments above theirs have much smaller balconies. Well, as I said, this is an English speaking neighborhood, so when people get dressed up for Purim, they’re more likely to choose the kinds of costumes you might see people wear in the United States for Halloween. Not revealing or scary costumes, but costumes that relate American culture. So this one Purim, my family is about to sit down for the festive meal. All of a sudden my mom sees something dark and big zooming past the glass door that leads to the balcony, and everyone hears a loud bang. She rushes to the balcony to find out what it is and slides the door open. There’s a man on the balcony. He jumps to his feet, and she sees he’s dressed as Batman! BATMAN! An ultra-orthodox Jewish Batman! And he is drunk. So drunk he has no idea he just fell two stories and is lucky to be standing at all. He sees the open door, rushes past her with his black cape flying behind him, rushes past my dad who cannot believe what he’s seeing, leaves the apartment, and heads back upstairs. And that is my mom’s funny story about how Batman literally crashed her Purim feast. Every year I hand out creative Mishlo’ach Manot baskets. 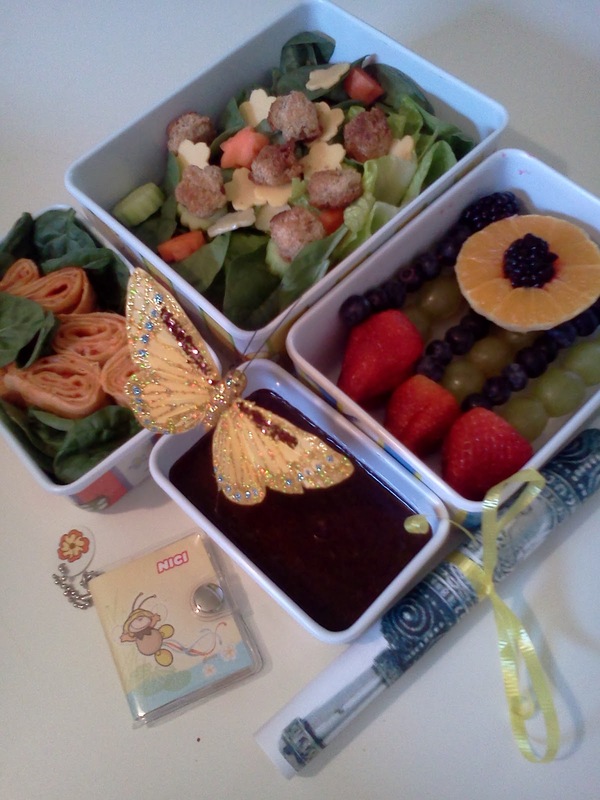 One year, I created a booklet about “Winnie the Pooh-rim.” Another year I made bento boxes with a flower and garden design. Yet another year I created an Alice in Wonderland picnic. This year, however, I’m not allowed to give more than one Mishlo’ach Manot, because my mother passed away in December, and my daughter will be handling the Mishlo’ach Manot instead. Still, I hope you have a wonderful Purim. It is my favorite holiday, and that’s something I can’t disguise. If you are one of my siblings or one of my cousins on my mother’s side, and I say that I’m about to tell you the story of Savtah Rivka, the white lace gloves, and the white lace parasol, you’re probably already smiling. It is, after all, a beautiful story that perfectly captures the force of nature that was my grandmother. Rivka Schorr was born in Jerusalem in the early 1910s, at a time when the Turkish Ottoman Empire stretched over three continents with Jerusalem more or less at the center. World War I raged when she was still a little girl, and when the war was over, and Western Europe had won, the victors broke the Empire apart into numerous new countries. The area of land that the Romans had called Palestine was handed over to the British, and in 1917 the Balfour Declaration vowed that Palestine would become a homeland for the Jews. Young Rivka Schorr grew up mostly under British rule, and she was still a little girl when the British divided Palestine into two parts. The larger part to the east of the Jordan River was given to a sheikh to create the Hashemite Kingdom of Transjordan. The third to the west of the Jordan River was still promised to the Jews, and she grew up with the hope of seeing that dream become a reality. Rivka was the daughter of a respected orthodox rabbi, who was also a newspaper editor. She was not my great-grandparents firstborn. She was the youngest. But she was the only one to survive past infancy. Naturally, her parents doted on her. I don’t know how old she was at the time of this story. My guess is that she was probably twelve or thirteen. Both of my grandmothers grew up in Batei Machaseh, apartments that were built to house Jewish families outside the walls of Jerusalem's Old City, so this is where the story takes place. Young Rivka had the proper upbringing for an Orthodox Rabbi’s daughter at the time, which meant she didn’t go to school. There was, as far as I can tell, only one school in the world for Orthodox Jewish school for girls—Bais Yaaakov—and it was very new and very far away in Poland. Orthodox Jewish boys in Jerusalem went to yeshiva, but orthodox Jewish girls were expected to be educated at home by their mothers, governesses or tutors. This, however, didn’t suit headstrong Rivka Schorr. Rivka was determined to go to a real school, never mind what was expected of a rabbi’s daughter! The Evelina de Rothschild school for girls in Jerusalem had a required uniform. Rivka couldn’t ask her parents to buy what she needed. Oh, no. They never would have agreed. So she wrote to a cousin in Austria, and asked him to secretly send her a white lace parasol and a white lace pair of gloves. She took them to a hotel in what today is the Armenian Quarter in Jerusalem’s Old City. The hotel belonged to a Jewish woman who later became the grandmother of my writer cousin Emuna Elon’s husband, former Israeli Member of Parliament, Rabbi Binyamin Elon. The hotel’s owner agreed to hold on to the parasol and gloves so that Rivka could pick them up on her way to school. I imagine young Rivka was very proud of herself, sneaking out behind her parents’ backs, conspiring with her European cousin and with the owner of the hotel, and attending school where no one knew that her parents would have disapproved if only they had known what she was up to. Unfortunately, however, she couldn’t fool everyone. Somehow the Maggid, the old Jewish version of the town crier, found out, and he was determined to make sure that everyone heard about it. The Maggid told him. My great-grandfather was so embarrassed. And young Rivka Schorr’s secret was a secret no longer. I wish I could say the story has a happier ending, that my Savtah’s father hadn’t bowed to the expectations of orthodox Jewish society in Jerusalem at the time. But he did. Rivka wasn’t punished, of course. Her parents doted on her too much for that. Instead her father expressed his disappointment and told her he would find tutors for her in any subject she wished to study. And he kept that promise. My grandmother was brilliant and well educated. While her mother could only speak Yiddish, my grandmother learned to converse in Yiddish, Hebrew, Arabic, Ladino, and three other languages. She made friends everywhere she went, and when she got old and it was time for her to move into a nursing home, she was surprised to discover she already knew most of the residents. The women joyfully cried, "Rivka!" and welcomed her with hugs. Still, I love to picture my Savtah as a young girl with white lace gloves and a white lace parasol secretly walking to school in Jerusalem, a young girl determined to get an education who would not let society’s expectations stand in her way. Picture a young woman nineteen years old standing on the deck of a ship, sometime about 1900. She is on a journey to a land both strange and familiar, the land of her ancient ancestors. Her black dress stretches down to her black shoes, and the lace apron that clings to the top of her dress is something she crocheted with her own nimble fingers. In one hand, she clutches a prayer book. The other pushes her glasses higher up on the bridge of her nose. She brushes back a wisp of hair pulled loose by the wind. She has a sharp mind, a quick wit, and a surprisingly strong sense of irony for someone so young. She is leaving safety and comfort of the only world she has ever known, and she is heading for a new one fraught with peril. She is on a journey to prove to those she left behind that they are wrong about her. There is a prayer on her lips and hope in her heart. This is my great-grandmother Bat-Sheva, a rabbi’s daughter and, through no fault of her own, a young divorcee. She is on a journey from Poland to Jerusalem, the city where one of her ancestors—the woman whose name has been passed down in her family for thousands of years—was once a queen. Now it is under strict Ottoman rule, as it has been for centuries, but that will change in a few years. Soon she will be a witness to history. But on this day she thinks about her tarnished reputation, and still she holds her head high. It wasn't her choice to get divorced. It wasn't even her choice to get married, not exactly. She was a rabbi’s daughter from Poland. He was a rabbi’s son from Austria. They were from two of the most respected rabbinical families in Europe. Everyone had agreed that it was a good match. A year later, however, her groom changed his mind. He demanded a divorce, claiming that she was barren. How could he stay married to this girl, if she couldn't bear him any children? What would become of his illustrious family line with no one to follow him? And so a divorce was granted. And so the rumors began. Bat-Sheva wasn't fit to be a wife. She couldn't have children. At nineteen years old, though, my great-grandmother could share her secret with no one. After all, who would believe that a rabbi's son would not sleep with his wife for an entire year? The Torah demands it. Nature, for most men, demands it. So what sort of man would not fulfill this mitzvah? She couldn't simply tell people the truth. No one would believe her. She had to prove she was not the barren girl her husband had claimed. But she was a rabbi's daughter. She couldn't marry just anyone. And no rabbi wanted his son to marry a barren woman. People talked in two countries and in every country in between. Everyone knew the rumors. But only she knew the truth. As luck would have it, she wasn't alone. In another part of Europe, there was a rabbi's son whose reputation had been similarly tarnished. My great-grandfather's first wife had “decided to become nonreligious,” which was a common euphemism in the orthodox Jewish world to describe a woman who had run off with another man. Of course, you can imagine the gossip. No rabbi wanted his daughter to become this young rabbi's second wife. My great-grandmother and great-grandfather found out about each other, probably through a matchmaker. It was decided that the best course of action would be for both of them to start over in a place where they had no reputations, a place where they would be wanted, a place like Jerusalem. 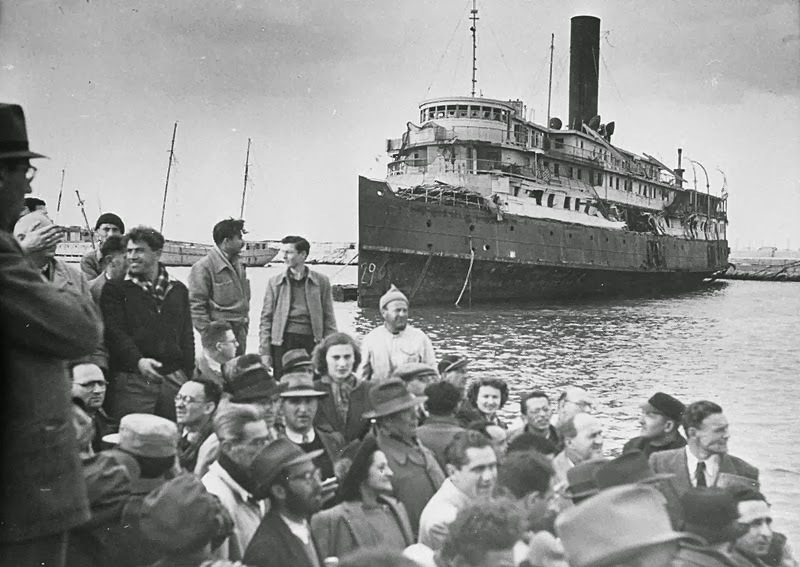 Holocaust survivors attempting to get into British Mandate Palestine with the Exodus in the background on July 18, 1947. (The Palmach Archive vis PikiWiki) My great-grandmother Bat-Sheva arrived when the land of Israel was still under Ottoman rule about fifty years earlier. People sometimes think I'm brave, because I’m raising autistic son. I think I am about as brave as the great-grandmother I am named after. I am brave through lack of choice. What other choice do I have? What other choice did she have? She could have let the lies and the gossip destroy her, or she could try to fix the situation. And so she uprooted herself and set out on a journey to fix it. I've learned three lessons from my great-grandmother’s story. I don't want to hear it. They don't know the whole story; and until they do, they have no right to judge. If they are truly my friends, I will support them both. Second, people who love each other should be together, and people who don't love each other shouldn't. Why is this so difficult for some people to understand? I don’t know why my great-grandmother’s first husband never shared a bed with her, but clearly he didn't love her the way a husband should love his wife. Perhaps he loved someone else, and perhaps societal pressures prevented the two of them from being together. We all deserve love. We all deserve to be happy. And when two people are denied that, the unhappiness it causes ripples out into the world. Love is hard enough to find, and there's nothing we want more. Who are we to deny it to two people who are fortunate enough to have found it in each other? And finally, I learned that sometimes bad things happen for a reason. Perhaps it was not enough for my great-grandparents to get married, so they could have my grandmother Rivka. Perhaps it was necessary for both of them to suffer from gossip in Europe so that when they married and started a family, it would be in Jerusalem. My great-grandmother saw the Ottoman Empire replaced by the British Empire, and she saw the British Empire give way to the Jewish state. If she had stayed in Poland or Austria . . .
At nineteen, my great-grandmother stood on the deck of a ship, with a prayer book in her hand and something to prove. And soon her prayers were answered.